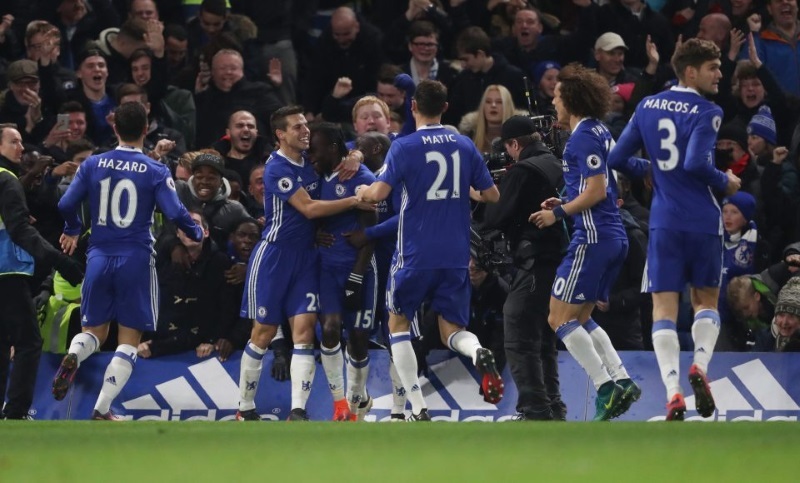 Chelsea fought back for a 2-1 win over Tottenham Hotspur that cemented their place on top of the Premier League, while title rivals Manchester City and Liverpool kept pace with the leaders on Saturday. Antonio Conte’s Chelsea had been knocked out of pole position by City’s 2-1 win at Burnley and Liverpool’s 2-0 success against Sunderland earlier in the afternoon. But they regained their one-point lead over second-placed Liverpool, who are level on points with third-placed City, thanks to a gritty London derby success at Stamford Bridge that made it seven successive league wins for the Blues. Chelsea hadn’t conceded a league goal since September 24, but Christian Eriksen fired Tottenham ahead in the 11th minute with a ferocious long-range strike. Despite being outplayed for much of the first half, Chelsea went back to the dressing room on level terms thanks to a sublime curling effort from Pedro just before the interval. In the 51st minute, Diego Costa picked out Victor Moses at the far post and his shot was deflected into the net off Jan Vertonghen as Chelsea ended Tottenham’s 12-match unbeaten league run. “These games are difficult, It was a tough game with a lot of intensity,” Conte said. Earlier, Sergio Aguero scored two scruffy goals as City saw off Burnley and Liverpool followed suit by downing Sunderland with goals from Divock Origi and James Milner after losing Brazilian playmaker Philippe Coutinho to a worrying injury. “It was an intense game for us and a deserved win at the end,” said Liverpool manager Jurgen Klopp. Swansea City claimed an extraordinary 5-4 win over fellow strugglers Crystal Palace, while champions Leicester City narrowly avoided a seventh defeat of the campaign in a 2-2 draw with Middlesbrough. Having seen City prevail at Turf Moor in the early game, Liverpool were under pressure to produce the goods against a Sunderland team who had won their two previous matches. In the first half, the influential Coutinho was stretchered off with his right ankle in a brace after hurting himself in a challenge by Didier Ndong. Origi took the Brazil international’s place and he gave Liverpool a reward for their dominance in the 75th minute with his first league goal of the season. Jordan Henderson picked the Belgian forward out on the left and he cut inside onto his right foot and swept a shot inside the far post. Milner completed the victory from the penalty spot in the first minute of injury time. Burnley took a shock 14th-minute lead against City when Dean Marney met Nicolas Otamendi’s headed clearance with a thumping 25-yard volley that nestled in the bottom-left corner. But Aguero equalised in the 37th minute, stabbing home after Burnley failed to clear a corner, and the hosts’ luck continued to desert them as both Marney and Johann Berg Gudmundsson went off injured. A defensive mix-up allowed City to net the decisive goal on the hour, with Fernandinho’s cross striking Aguero and going in after Ben Mee and Stephen Ward had got in each other’s way. “We are so satisfied for the points and the performance, especially two days after the Champions League,” said City manager Pep Guardiola, whose side host Chelsea next weekend. Swansea upped the pressure on Palace manager Alan Pardew by condemning the south London club to a sixth straight defeat in a madcap game that gave Bob Bradley his first win since becoming manager. Palace led 1-0, fell 3-1 down, fought back to go 4-3 up, but eventually succumbed courtesy of a remarkable brace of injury-time goals from Spanish striker Fernando Llorente. “Crazy, at 3-1 I thought we were in control. That’s one we won’t forget,” Bradley said. The victory took Swansea off the foot of the table, where they were replaced by Sunderland, and left Palace above the bottom three on goal difference.